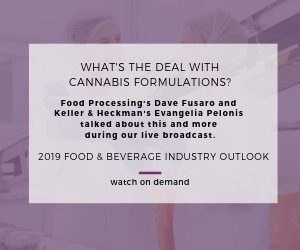 Home / Industry News / 2019 / Crackdown Raises Question: Is CBD Medicine or Food? Crackdown Raises Question: Is CBD Medicine or Food? Local health inspectors are cracking down on the use of a hemp-derived substance in food products on the ground that it’s now part of a prescription drug, and so its use as a food ingredient falls afoul of federal regulations. Cannabidiol (CBD), a non-psychoactive derivative of hemp, has been widely touted for relief of pain and anxiety. With the passage of the Farm Bill in December, industrial hemp and its derivatives are now legal for sale and consumption across the U.S. But the FDA has approved the use of CBD in Epidiolex, an anti-seizure prescription medication that was rolled out in November. Health authorities in New York City and elsewhere are interpreting that to mean that CBD’s use as a food or beverage ingredient is forbidden due to an FDA regulation that bars the use of prescription medication for that purpose. The Wall Street Journal reports that health inspectors in New York City warned retailers selling CBD edibles that they would start fining them this fall. Health inspectors in Ohio, Maine, North Carolina, Georgia and Michigan have issued similar warnings, the Journal reports. The FDA has considered regulatory alternatives, such as promulgating separate regulations for high and low concentrations of CBD. But changes in regulations could take years, which is too slow to suit the fast-moving CBD market.